The 21st century slummification of British city suburbs has received little media attention, with most coverage seemingly focused on London. Thousands of people are living in slum conditions in sheds in London’s suburban gardens. An undercover investigation found illegal immigrants from India are crammed with their children into rotting outhouses or grossly overcrowded homes in Southall. Families are sleeping on squalid mattresses without water and heating and where the electrical supply is often a fire risk. Researchers for Channel 4’s Dispatches also found similar conditions in Newham and Slough. More than 10,000 such illegal shacks are believed to exist across London and the Home Counties, populated by a hidden underclass that is being exploited by rogue landlords. Jon Snow, who presents tonight’s documentary, said it proved a “shocking eye-opener” and believes councils are afraid to tackle “racketeering” landlords for fear of adding thousands of people to their housing waiting lists. In Birmingham, the city council has taken a ‘relaxed’ view about back garden ‘redevelopments’, and turned a blind eye to the appearance of huge jerry-built outhouses converted from garages. Planning permission is apparently somewhere between optional and a retrospective formality. It’s common for residences with bidonville outhouses to have three or more vehicles, and with their back-alley garages gone, the result is illegal parking on verges, and shouting matches about parking spaces in the street, conducted by ‘bidonvilla’ occupants. For years, Birmingham city council have put been putting leaflets through letterboxes warning people not to park on verges, but their own planning ‘policy’ is largely responsible. 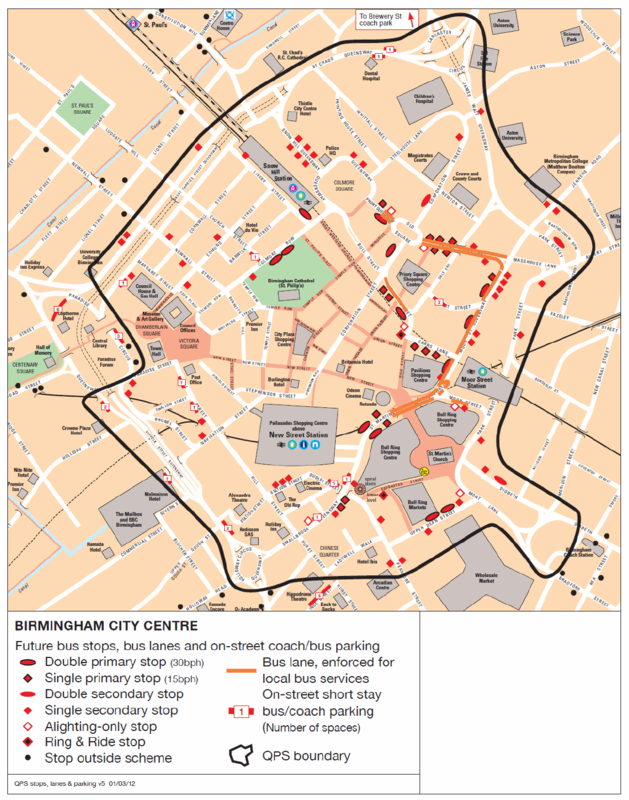 Centro’s Birmingham City Centre bus Statutory Quality Partnership Scheme (SQPS) has fomented disconnectivity and bus stop overloading. 1.1 Centro and Birmingham City Council (BCC) are investing around £15 million in improvements to passenger facilities and highway infrastructure in Birmingham city centre, in advance of the construction of the extension of Midland Metro from Snow Hill station to New Street station via Upper Bull Street and Corporation Street. 1.2 To support this investment and ensure that bus operators using the improved facilities deliver a high standard of service, Centro and BCC have introduced a statutory Quality Partnership Scheme (QPS) that covers all local bus services using stops in the city centre area. A QPS for the city centre is considered to be the most appropriate way forward. The agreement will support the delivery of several aims for improving the quality and management of the city centre, including: to provide a better quality of service for bus passengers; an improved standard of public transport infrastructure; to provide stability for the bus network during Midland Metro and New Street Gateway construction programmes; to address bus-related aspects of wider air quality problems; to equitably manage available kerb space; and to protect partners’ investment in public transport. 1.3 To encourage further investment in the bus network, the QPS introduces a series of regulations governing how bus services operate in the city centre, requires improvements in vehicle quality, seeks to address air quality issues and promotes a better image of public transport to attract additional users. 1.4 The Scheme Area covers 90 bus stops/stands and shelters within Birmingham City Centre, as shown overleaf. 1.5 The Scheme will be introduced on completion of the main phase of highway works in the city centre, on 22nd July 2012, and will operate for an initial period of 10 years, until 9th July 2022. 1.6 A primary bus stop is one at which a bus will be able to wait for up to five minutes, and will generally be the main terminus point for a service in the city centre. Secondary stops are the pick-up/set-down stops used by services on their way into, and out of, the city centre. 1.7 In order to ensure that the primary bus stops don’t become too congested, a limit has been set on the number of buses using each primary stop. This will provide buses with longer time at their primary stop, providing greater scope for buses to leave the city centre on time, thereby improving service reliability. 1.8 The requirements of the Scheme will apply to all registered local bus services using bus stops within the Scheme Area. It does not apply to schools services, Ring & Ride services, scheduled long-distance coach services or tours, services operated using heritage vehicles, rail or Midland Metro replacement services or services operated by Community Transport organisations. 1.9 Coaches are still allowed within the scheme area. However, as the scheme restricts the use of all bus stops and bus stands to local services only, coaches are not permitted to use them. Boarding and alighting of passengers can still be carried out on single or double yellow lines, providing the driver is not causing an obstruction. However once the passengers are off the coach it must then move off. Existing on-street short-stay coach spaces have been retained, a few additional spaces have been provided and longer-stay coach parking is available at the Brewery Street facility. 1.10 Registered local services are required to meet certain criteria, in order to be granted permission to use the city centre bus stops. These criteria will require that: the vehicles used are low-floor, easy access, and comply with all Equality legislation requirements by 2016 all buses are fitted with electronic number and destination displays to front, side and rear drivers shall drive in a safe, courteous and professional manner, wear a uniform and that a driver training programme be in place including diversity/disability awareness training drivers will be required to assist passengers in wheelchairs by lifting or deploying ramps all operators offer ticketing product(s) that permit passengers to interchange between services without the payment of a separate fare. 1.11 In order to address air quality problems that are currently experienced in certain areas of the city centre, and the requirements of the Air Quality Action Plan adopted in early 2011, buses will have to comply with stringent emissions standards. From 6th January 2013, as a minimum all buses will have meet Euro 2 standards, with those used on services operating every 20 minutes or better (three or more buses per hour) having to meet the Euro 3 standards. Starting on 3rd January 2016 and concluding by 28th May 2017, all buses operating services every 20 minutes or better will have to be to Euro 4 standards as a minimum, with Euro 3 for services operating fewer than three buses per hour; the phasing depends on whether a vehicle is single- or double-deck. 1.12 For its part, Centro agrees to maintain all the new passenger facilities to set standards, including displaying up-to-date timetables at each stop, the provision of Real Time Information displays at most stops and the regular cleaning of the bus shelters and stop poles/totems. Centro will also manage the use of bus stops within the Scheme area, to ensure that no stop becomes congested. 1.13 Birmingham City Council has agreed to maintain the highway infrastructure to set standards, and will also monitor and enforce bus lanes through the use of CCTV camera systems and address illegal parking on bus stops under its civil parking enforcement powers. Has Centro managed “the use of bus stops within the Scheme area, to ensure that no stop becomes congested”? On 19 December 2012, Michael Fallon, Minister of State in Britain’s ‘Department for Business, Innovation and Skills’ stated that West Midlands councils would have to work out for themselves how to ‘spread HS2 benefits’ beyond the station sites. That is a great opportunity for the region as a whole, with the benefits spreading beyond the station sites and into the wider city region. There is a challenge for councils in the west midlands and their partners to work together on how to achieve that. the Y network would by-pass the Black Country, Coventry, and the built-up area of Solihull. Centro, the West Midlands transport authority, has alternated between publicly asserting that the official HS2 scheme would provide good connectivity and lobbying the government for changes in HS2 (and more funds) to mitigate its disconnectivity. In the past few months, several comical schemes for mitigating HS2 shortcomings have emerged. In the summer, Paul Kehoe, chief executive of Birmingham Airport, proposed moving the entire airport to the east to be closer to Bickenhill HS2 station. Not to be outdone, the end of 2012 has seen Centro touting cable cars in Birmingham city centre and tram-trains running between Bickenhill and Coventry along the West Coast rail track. may involve a walk between [New Street and Moor Street] stations in Birmingham which may not be suitable for passengers with mobility impairments or carrying heavy luggage. But in the HS2 scheme, transit between New Street and the HS2 station behind Moor Street would be a requirement for many journeys, throughout the year. So HS2 would bring Birmingham Christmas every day, but not in a good way. Earlier this week, train services on Britain’s East Coast Main Line were severely disrupted by overhead line damage near Hitchin, which is around 50 km north of London. [Daily Mail, 17 December 2012, updated 18 December] Train operator East Coast cancelled all trains out of London King’s Cross and ran diversionary train and replacement bus services to the North after electric power lines near Hitchin were mysteriously damaged. National Rail said at least 14 ‘droppers’ – part of the overhead wire – have been broken and contact wires damaged, causing further damage to passing trains. The failure caused all services from the South – leaving London at a rate of up to four an hour – to be cancelled and forced services from the North to end at Peterborough subject to diversions or replacement buses. Currently, the East Coast Main Line carries most or all London-bound passenger traffic from North East England, Eastern Scotland, Yorkshire and Lincolnshire. However, under the government’s vision for high speed rail in the year 2032, long distance high speed (LDHS) services from the West Midlands, East Midlands, Northern England, and Scotland, would be transferred onto the new-build Y network, with 18 trains per hour operating on each track. Re-routeing the LDHS trains away from the East and West Coast Main Lines would supposedly “free up capacity for more regional, local, and freight services”. However, on their busiest sections near London, much of the East and West Coast lines have long had separate Relief (‘Slow’) tracks for local and regional services. Concentrating LDHS trains onto the twin-track London — West Midlands HS2 trunk would pose difficulties for service reliability and resilience. On the classic network, disruption incidents might be handled by measures such as diverting trains, de-training passengers at intermediate stations, and / or dispatching rescue diesel locomotives. How such options could be implemented on HS2 Ltd’s railway, is entirely unclear. My guess would be that Alison Munro, David Begg, and Andrew Adonis haven’t given the topic a moment’s thought. most trains could not be diverted, because their loading gauge would not be compatible with the classic network. diversionary routes are generally available (because their loading gauges are the same). It seems reasonable to conclude that an effective recovery strategy for a Hitchin-style event on HS2, is unlikely to be feasible. Though a great deal of work is being undertaken in to improve the quality and quantity of passenger count data collected on Britain’s railways and the outputs derived from these data, it is ‘work in progress’. And whilst aggregate statistics are of ‘reasonable quality’, due to the nature of the data, statistics on individual services are not robust. So said the Department for Transport in its autumn 2011 England and Wales ‘top ten’ overcrowded train services data sheet, published on 19 December 2012. The warnings about data quality were not heeded by Centro’s @GoHS2 campaign, which tweeted “3 of top 10 most overcrowded services are Euston-Birmingham, but #HS2 opponents still say there’s no capacity problem!”. As previously discussed on the Beleben blog, there is a capacity problem on Euston commuter trains, but it is caused by a shortage of rolling stock, and inefficient production management. It is not caused by an intrinsic shortage of line capacity out of Euston. Centro should be well aware of London Midland’s operations shortcomings, as hundreds of the company’s West Midland train services have been cancelled over the last few months. And on 14 December 2012, the Birmingham Mail reported that Birmingham Labour councillor Phil Davis had accused London Midland of management failure. It might be worth looking at the wider issues raised by Department for Transport top ten data sheet. The Department for Transport (DfT) collects rail passenger counts from train operating companies to monitor train crowding levels. All franchises let by DfT require the train operator to address crowding and to plan their timetables in such a way as to ensure, as far as possible, that crowding is not unduly concentrated on any particular route or individual service. 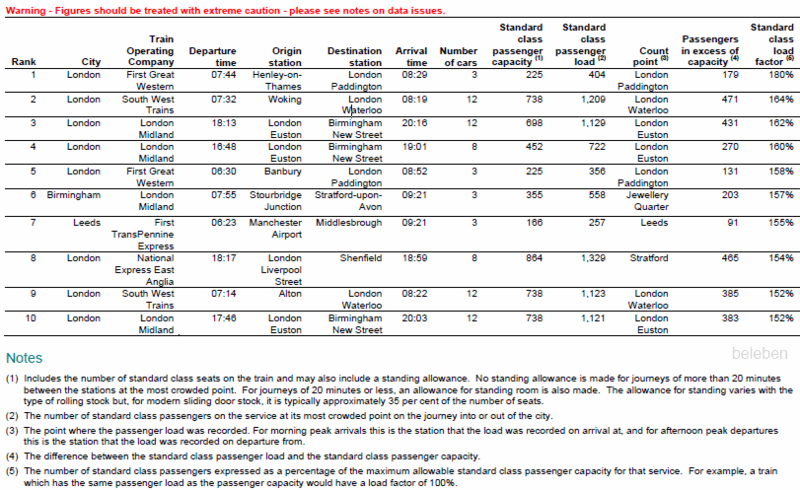 The table included in this paper shows the ten most overcrowded peak services in the autumn 2011 passenger counts data. The ‘top ten’ services in autumn 2011 were between 52 and 80 per cent over their capacity limit. These figures are taken from internal management information used for monitoring purposes. DfT is making this list public because of the demand for this kind of information. It should be noted that there are a number of data issues associated with passenger counts which must be considered when referring to the table below, and detailed notes follow the table. The ‘top ten’ list is generated from arrivals into eleven major cities during the morning peak (07:00-09:59) and departures from these cities during the evening peak (16:00-18:59) on a ‘typical’ weekday, for franchised operators only. The passenger load figure is the count at the busiest point on the particular service. This can be an interchange point outside the city on the route concerned (e.g. Stratford or Ealing Broadway on approach to London) and does not always correspond to the terminal or city centre station. In all cases, the autumn data were collected prior to the December 2011 timetable change. Some of these overcrowding figures are derived from one-off measurements of the passengers on a particular weekday and are not an average representation of overcrowding on the service over a period of time; so the figures represent a one-off snap-shot from autumn 2011 only and do not provide a guide to current overcrowding. The ‘top ten’ list is determined based on ‘load factor’, which is the number of standard class passengers on a service expressed as a percentage of the maximum stated standard class passenger capacity for that service. For example, a train which has the same passenger load as the passenger capacity has a load factor of 100 per cent. For shorter journeys, where the journey time between stations at the most crowded point is 20 minutes or less, the capacity figures given in the table take account of the number of standard seats plus a standing allowance, which is determined based on the type of rolling stock. For longer-distance services, where there is a gap longer than 20 minutes between stations, capacity is calculated as the number of standard seats only. A number of services included in the table have their capacity calculated as “seats plus standing” in line with the definition above. Capacity is based on seats only. Service has first class. First Great Western has recently strengthened this service by adding an additional carriage, so that the number of standard class seats has increased to 340. Capacity is based on seats only. Service has first class and train is at maximum length. From December 2012 London Midland will provide three Class 350/2 ‘high density’ units for this train to maximise the number of seats. In the long term, London Midland has 10 new 4 car trains on order that will allow them to operate additional trains on this route from 2014. London Midland plans to increase the capacity on this service by lengthening it from 8 cars to 12 cars in December 2012. In the long term, London Midland has 10 new 4 car trains on order that will allow them to operate additional trains on this route from 2014. From September 2012, this service has started from Oxford not Banbury, leaving Oxford at 07:00. It is now operated by a different type of rolling stock which provides a higher standard class seating capacity. More recent counts suggest much lower loadings on this service. In the long term, from the May 2014 timetable period it is planned to introduce a fifth train per hour between Manchester and Leeds. Capacity includes seats and a standing allowance. Train is at maximum length. In the long term, London Midland has 10 new 4 car trains on order that will allow additional trains to be operated on this route from 2014. * Though a great deal of work is being undertaken in to improve the quality and quantity of passenger count data collected and the outputs derived from these data, this is work in progress. Whilst we believe that aggregate statistics are of reasonable quality, due to the nature of the data, statistics on individual services are not robust. * The overcrowding figures for the ‘top ten’ services are often derived from one-off measurements of the passengers on each train on a particular weekday. They may not be an average representation of overcrowding on the service over a period of time. Furthermore, some of the passenger load numbers are obtained by manual counting and so there is a significant risk of human error. Hence the figures should be treated with extreme caution. * As the figures included in this release are a one-off snap-shot from autumn 2011 they do not provide a reliable, accurate guide to current overcrowding. For example, extra capacity has already been introduced on some routes. * It should be noted that some of the services in the ‘top ten’ list are atypical, in as much as they are services/routes on which additional capacity cannot be provided without unrealistic changes to infrastructure. * The data collected are intended to represent a ‘typical’ weekday (usually Tuesday to Thursday). Historically, the department has only monitored crowding levels for London and South East operators. In co-operation with train operators, the Department has been expanding its capacity to monitor crowding in key regional cities, and published new statistics this year showing weekday passenger numbers and crowding in a number of major cities in England and Wales. It should be fairly obvious that measurement of crowding and load factor needs to be based on something better than one-off point estimates of passenger numbers. And there needs to be an accounting of items such as capacity usage in first class, the duration of instances of standing, and a standardisation of the persons-per-unit-area for standees. Chiltern Railways’ timetable for the period 9 December 2012 to 18 May 2013 provides an improved service to and from Birmingham’s Colmore business district, according to the company. The Birmingham Post reported the comments of Thomas Ableman, Chiltern’s commercial director. “In September last year we launched our new fast service but all trains started and finished at Moor Street. “We had a lot of lobbying from Colmore Business District saying it would like to see services from Snow Hill. “We hugely improved Moor Street but it was more difficult to operate services from Snow Hill – there were quite a lot of costs. The Mainline service has already reaped dividends for Chiltern Trains, with passenger numbers increasing by 40 per cent, something Mr Ableman described as “dramatic growth”. However, there have also been some negative outcomes, as the Bucks Free Press reported on 5 December, when the old timetable was still in use. As reported there has been outrage in Princes Risborough after the new December train timetable has been released but this also stretches to Saunderton and Haddenham. Popular non-stop services to and from London to Princes Risborough at 7.28am and 6.13pm have been axed and further services cut from Saunderton. David Palmer, secretary of the North Chiltern Rail Users’ Group, said although the service is incomparably better since he started commuting in 1987, every time Chiltern introduces a new timetable Princes Risborough and Haddenham seem to lose out. To get in at the same time people who previously got the 7.28am will now have to get the 7.14am. The non-stop 6.33am has also been scrapped. Martin Howard, from the Saunderton Rail Users Group, said commuters from Saunderton will also have to put up with a worse service. In the December timetable there is only one train leaving Saunderton for London after 6am that enables commuters in the capital to get to work for 9am, which gets in at 7.56am. Currently there is a 6.09am which gets in at 07.03am, a 6.17am which gets in at 7.13am, a 6.42am which arrives at 7.35am, a 6.47am which arrives at 8.05am and a 7.42am which gets in at 8.27am. Mr Howard said this removes everyone’s flexibility and then in the evening there is only one train coming home an hour. Graham Cross, Director at Chiltern Railways said: “Following the introduction of our new timetable in September 2011, our customers had some concerns about the changes. This feedback helped us understand that what was important to our customers was a reliable and punctual timetable that had a better availability of seats and a repeating pattern of trains in terms of departure times, making it more memorable. The December 2012 timetable was built on these principles. Chiltern Railways managing director Rob Brighouse is to attend a meeting of Princes Risborough town council on 15 January 2013, to speak with local commuters. Commuter and intercity traffic on the Chiltern Main Line is not particularly intensive, and pathing problems are the legacy of underinvestment and track rationalisation carried out in the 1970s and 1980s. Like other stations on the route, Princes Risborough station once had two fast lines running through the middle of the station. Its Up Fast line was restored in September 2011 as part of the Evergreen 3 upgrade. However, capacity potential would be maximised by reinstating the Up and Down Fast lines at all stations on the Banbury cut-off. In the Rail Package 6 base concept, the Chiltern Main Line would take over London to West Midlands intercity traffic. With restoration of through tracks at stations and reinstatement of 15 km of four-track between Seer Green and South Ruislip, would come the opportunity to improve commuter service to Risborough. And in the East West Rail proposals, Princes Risborough would be served by through trains to Bletchley. Birmingham city council leader Sir Albert Bore has described a growing gap between the council’s income and demand for its services as the ‘jaws of doom’, and warned that it would have to decommission entire activity areas over the next few years. But as the Birmingham Post’s Neil Elkes reported on 14 December, the proposed 2013 – 2014 budget has continued with ‘salami slicing’ across services to achieve a £110 million spending cut. The council has opened a budget 2013+ ‘consultation process‘, open until 6 January 2013. However, the 56-page ‘Business Plan and Budget 2013+ Have Your Say’ document, produced to support the consultation, provides little detail on how money is spent. [The Budget Consultation] has been launched against a backdrop of greater than previously notified grant reduction from national government and at the same time the council needs to pay for unavoidable cost increases. The combined impact of these grant reductions and cost increases means the council is having to make cuts of over £600m over the six years 2011/12 to 2016/17. Some of the council’s departments are carrying out additional consultation on their specific proposals. Please click [https://www.birminghambeheard.org.uk/ConsultationDetail.aspx?consultationid=1488] for the Development and Culture consultation. This month, the council held four budget public meetings, where the panel was made up only of Sir Albert and members of his Labour group. At yesterday’s well-attended final meeting at Birmingham council house, members of the audience questioned whether Sir Albert should be both chairman and main speaker, and expressed doubt about whether the consultation was genuine. There was criticism of the top-down nature of the budget-setting process, as well as calls for the council to set a Derek Hatton-style deficit budget. How representative the audience was of Birmingham’s wider population, is difficult to gauge.